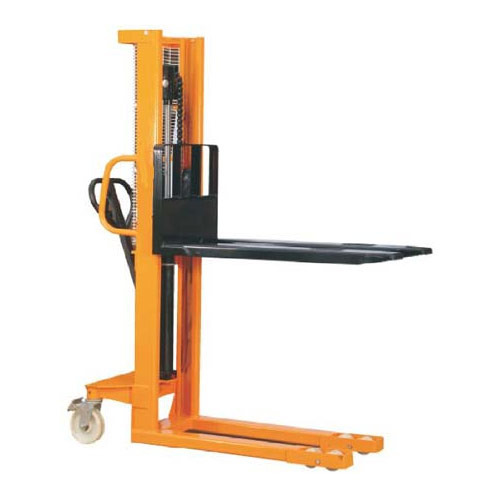 We are an eminent manufacturer of highly reliable Hydraulic Stackers. These stacker are developed with high precision by our dexterous professionals using premium quality raw material. Our product is widely acclaimed in the market for their safe features, sturdy construction, low maintenance, high performance, durability and reliability. We procure our raw material for the product from reliable vendors in this industry. Further, Our quality analyzers test these products on various parameters to ensure their adherence to set industry standards and quality norms. 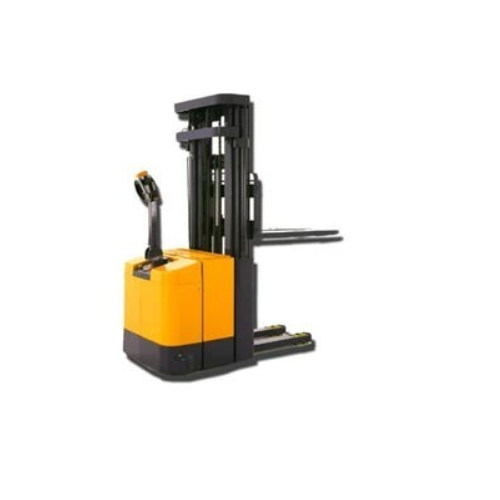 With the thorough knowledge of the varied aspects of the market, we have been able to bring forth the clients an excellent assortment of Hydraulic Electric Stacker. The offered range is manufactured using premium quality raw material, which is procured from the reliable vendors of the market. Besides, our professionals employ high end tools & equipment and sophisticated technology to fabricate the range as per the international quality norms & standards. Structure M. S. Pressed / rolled section frame construction work. Light in weight but ruggedly built. Fork carriage operates in maintenance free roller guides. 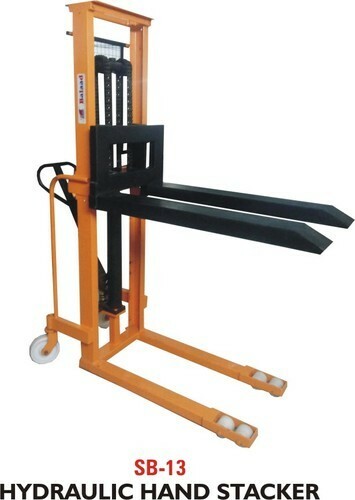 Fork carriage is equipped with fixed pallet forks. Hydraulic power pack compact system consists of electric motor (Crompton/Bharat Bijlee), gear pump (dowty), hand valve (Polyhydron), pressure control valve, suction strainer, breather filler, oil level indicator and oil tank with sight glass. The power pack is controlled by hand valve. The motor is 3 phase 2 HP 440 / 415 v a c 50 Hz. Hydraulic cylinder one no. Thick walled hydraulic cylinder tube with ground and hard chrome plated piston rod. Seals polyurethane with back ring. Control hand valve operated from floor level to lift and lower the working platform. Electrical all components provided in d. O. L. Motor starter ( l & t / bch make only ) like push button, contractors relay & limit switch (essen), etc. With 10mtrs , flexible cable. Wheels front M. S. Rollers-80 mm with two sealed ball bearing & steering polymer wheel-200 mm x 50 mm thickness with two sealed ball bearings in each wheel. Load capacity 600 up to 1500 kgs. With the help of our dexterous professionals we have come up with Hydraulicstacker. These are fabricated using high grade raw material that are procured from some of the most reliable vendors in this industry. The product is widely acclaimed in the market for their rugged construction, resistance to corrosion, high performance, easy functionality and durability. These are widely used for loading and unloading trucks, stocking shelves, die and mold handling etc efficiently. Our engineers keep in mind the set industry standards and quality norms while manufacturing these products. Clients can avail these from us as per their specifications for their maximum satisfaction. We ensure safe and timely delivery of the ordered goods so that the client does not face any delays. 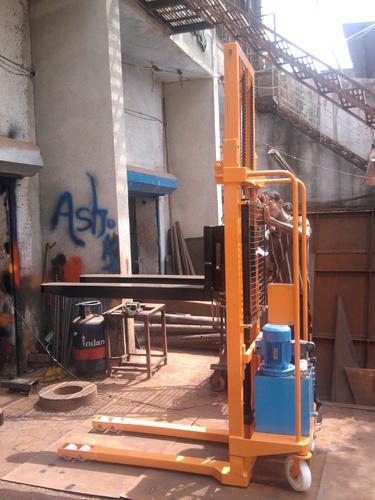 We hold expertise in manufacturing, supplying and exporting superior quality Manual Hydraulic Stacker. These stackers are manufactured using superior quality raw material, which is soured from the authentic vendors of the market. Moreover, offered in different specifications, these stackers fulfill the diverse requirements of our clients in an efficient manner. Available Options Electric Operated & Battery Operated. We have been able to cater to the various requirements of clients by providing a wide array of Counter Balance Hydraulic Stackers. Our products are fabricated using high quality-approved raw material and basic components. Fabricated under the supervision of our professionals, these products meet international quality standards. Moreover, before delivering it to the customer's end, these products are stringently tested on various parameters.